The rear of the house faces south and the garden slopes down to the nearby Avonbeg River. A major attraction is the stream which flows along two sides of the garden. The latter provides water for two split level ponds. 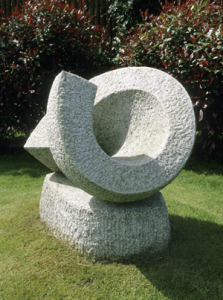 The sculpture collection evolved over a thirty year period (1986 – 2016). 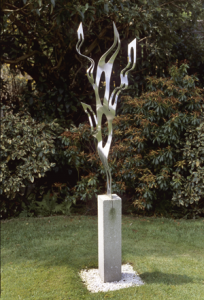 Each sculpture has over time ‘grown into’ the garden, just as the garden has ‘embraced’ each sculpture. The unity and harmony between the artistry of nature and humanity’s artistic endeavours has enabled Shekina become a place of great beauty. 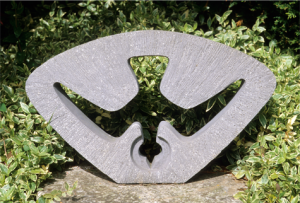 Other features in the garden include a gazebo, seating areas of stone, wood, or metal, two bridges, a weather vane, mirror, chimes, a fountain, metal arches, alcoves and a Zen spiral walkway.